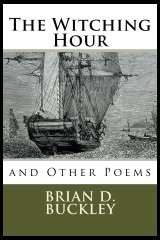 Fellow blogger and comrade-in-ink Dave Higgins was gracious enough to review The Witching Hour. See what he has to say! Unlike the compilers of some collections of poetry, who support their choices with an overarching theme or a long introduction explaining why these poems were gathered, Buckley is unafraid to choose poems on the simple rationale that he feels they are good. This produces a collection that is unashamed to admit that poets, like everyone else, are complex people who laugh and rage, cry and love. This collection contains 25 poems chosen and revised by the author, spanning the last decade of his oeuvre. Although there is no single theme, Buckley has grouped them into three sections, Visions, lolz, and Searching, containing respectively uplifting, humorous, and speculative works.